Before I go too far with this review of the Blu-ray Combo Pack release of director Dennis Villeneuve’s film Prisoners, I need to make a couple things clear. First, I’m a Hugh Jackman fan. I think he’s a very good actor who’s almost always a pleasure to watch. Even in less-than-stellar movies, he usually stands out. That’s not to say Prisoners is one of those movies, it isn’t. It’s just so you know where I’m coming from. The second thing I need to point out is my love of a adult drama. For a time Hollywood made a lot of these kinds of movies and they were often quite good. Occasionally, even excellent. Standouts in the past like The Fugitive, Jagged Edge and Presumed Innocent come to mind. Plus, more recent films like Argo and Silver linings Playbook are also good examples. But most of the time the industry seems consumed with the need to make and market movies for kids and skimp on things like character or story. I worry about the future of adult drama. Fortunately, a movie occasionally comes along that restores my faith, at least temporarily, that this art form will not be lost forever. Prisoners is one of those movies and it manages to deliver on almost every level. How far would you go to protect your family? Keller Dover (Hugh Jackman) is facing every parent’s worst nightmare. His six-year-old daughter, Anna, is missing, together with her young friend, Joy, and as minutes turn to hours, panic sets in. The only lead is a dilapidated RV that had earlier been parked on their street. 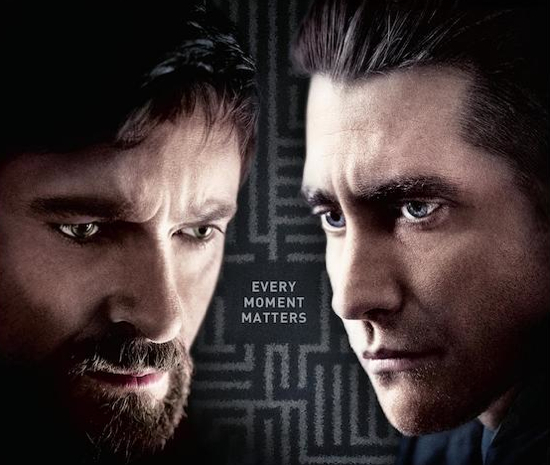 Heading the investigation, Detective Loki (Jake Gyllenhaal) arrests its driver, Alex Jones (Paul Dano), but a lack of evidence forces his release. As the police pursue multiple leads and pressure mounts, knowing his child’s life is at stake the frantic Dover decides he has no choice but to take matters into his own hands. But just how far will this desperate father go to protect his family? How far indeed. When you see this movie, you’ll know how far Hugh Jackman’s character is prepared to go. Let’s just say it’s pretty far. Prisoners is a tough movie with an edge. In short, adult drama. I liked it. As for the movie’s technical elements, they are also first rate and come through nicely on Blu-ray. The special features, including docs “Every Moment Matters” and “Powerful Performances”, are interesting and offer some insight into the process of making the movie as well as the actors performances, which are uniformly excellent. As someone who used to make movies, I find most of the special features less interesting than others might. Still, they are well done. Taken as a whole, the Blu-ray Combo Pack release of Prisoners is quite a nice package. If you’re a fan of well-executed, edgy, adult drama that pulls very few punches, Prisoners is definitely worth a look. It hits Blu-ray, On-Demand, iTunes, XBox, VDU and more today. The one who stands out in ‘Prisoners’ is Jake Gyllenhaal. His Detective Loki is the most intriguing of all characters and the heart of the story. I agree that Gyllenhaal was fantastic. The whole cast shows how an ensemble of great actors can lift what could be a generic mystery to the level of grew film. Hugh Jackman’s distraught father is at the heart of the film. His portrayal makes everyone else look even better than they are because it is Keller Dover’s anguish, moral dilemma and past failures that propel the whole film. His presence is felt even when he is not on the screen.